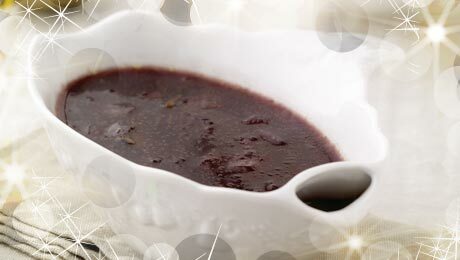 This gravy is fantastic with red meats and turkey, the Port giving it a lovely distinct flavour. By adding the butter just before serving it will add a lovely gloss to your sauce. In a small pot, melt 30g/1oz of butter with the shallot and thyme. Pour in the port and reduce by two-thirds, then add 500ml chicken stock and reduce again by two-thirds until syrupy. Pass through a sieve to another saucepan ready to be reheated. Just before serving add the remaining butter and stir into the sauce. The sauce can be made 2 days in advance and reheated in the saucepan, adding a splash more stock if too thick.